A young journalist for the Tribune Company becomes a product manager and money maker by acting entrepreneurially inside a large organization. Her big idea: Teaching the Web to the people formerly known as the advertisers. “Where’s the money going to come from?” has been the top question in journalism for several years now. Over the past four years, Tracy Samantha Schmidt, 27, has been on a journey into that question. She’s moved out of the expense column and into the revenue stream. 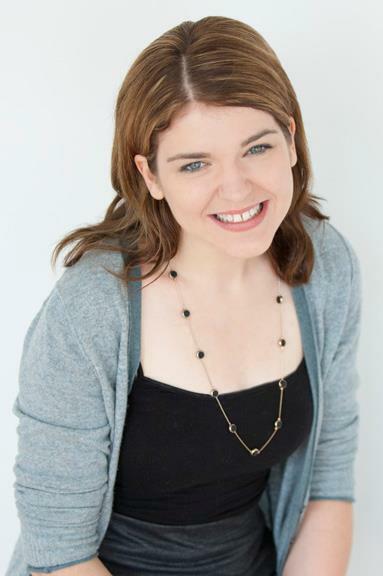 In 2008, Schmidt was a reporter with community manager duties at TribLocal, the Chicago Tribune’s hyperlocal play. (Before that she was a reporter and web producer at Time Magazine.) She became editorial director of ChicagoNow, the Tribune’s community blogging platform, in January of 2009. By November of 2010 she was brand manager and lead trainer at 435 Digital, a Tribune subsidiary. (“We help businesses grow through online marketing.”) There, she developed a series of classes in social media that made money. They also made customers for other Tribune services, which is called lead generation. In September, 2011 she was named manager of educational programs at Tribune Media Group; she is now developing classes for both Tribune readers and advertisers on a range of subjects. A few metrics: ChicagoNow launched in August 2009. By May, 2010 it was doing 20 million page views monthly. That spring, ChicagoNow was named one of five “innovative websites that could reshape the news” by Mashable and Poynter. Today ChicagoNow is a network of more than 350 local blogs. 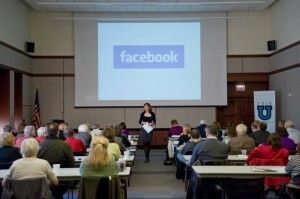 Schmidt began doing social media classes for the Tribune in March 2011. Since then, she’s taught more than 2,000 people in classes and private seminars nationwide. Journalism is going to need a lot more like her if it’s going to secure itself as a business. But I think they’re out there: talented young journalists who can help with the revenue puzzle, and who want to help solve it because they want journalism to survive. I was interested in how Tracy’s thinking had evolved and what she had learned by moving from a reporter’s role to a product manager’s, so I caught up with her for this interview. PressThink: When you joined the Tribune Company you must have been aware of its perilous financial state. Thinking back to when you worked at TribLocal, what was your view then of “the business model” problem? Did it occupy your everyday thoughts? Or was it someone else’s problem? Tracy Samantha Schmidt: Well, I didn’t think about the revenue model when I first got to Tribune. I was focused on content because that’s all I knew until then. I had been a journalist at Time Magazine in Washington and opted to take a buyout rather than transfer to New York. It was 2008 and everyone was talking about how journalism was falling apart. I moved back home to Chicago and learned about this incredible start-up at the Tribune called TribLocal and thought, that is the future of journalism– taking user generated content and integrating it into the printed newspaper. PressThink: You were focused on the future of journalism, but that did not mean the future of the business? Schmidt: It did not mean the future of the business to me at that point. I still didn’t understand how the media worked from a business perspective because I’d never been taught it, either as an undergrad journalism major or a graduate journalism student. I had a full understanding of being a reporter but I didn’t fully grasp how the paper was supported by a variety of revenue streams that were starting to decline. PressThink: Well, what did you know about it? Schmidt: I knew that circulation everywhere was in decline–both in newspapers and magazines–and that the media was now focused on making money online because that’s where advertisers were focusing. But that the challenge was most publications had given away so much content online for free, it was almost impossible to monetize it. PressThink: The “when is online going to pay for my newsroom?” stage. PressThink: Editors at that time assumed that online revenue would somehow magically “catch-up.” They had not really reckoned with the transformation of advertising itself, the economics of abundance, or the unbundling of the newspaper product. I gather than none of those things were clear to you then, when you were at Trib Local, but all are front and center now. Would that be accurate? Schmidt: TribLocal was actually a huge learning moment for me and was how I came up with the idea for what became ChicagoNow. PressThink: Okay, explain that to me. Schmidt: So essentially, my job at TribLocal was what we would today call a community manager. I went into the community and educated potential citizen journalists about our paper, about how they could post content and it might get published into the paper. And there was this one quilting bee in Downers Grove, IL where I explained to an audience of about 75 women that they could post their own stories, photos and event listings for free–and the best content would be published in a newspaper distributed with the Chicago Tribune. Well these women just jumped at the thought and within a week, they were all posting to TribLocal and telling their friends. So I started thinking: how do we scale this across the city of Chicago and also scale it across Tribune Media Group, which owned the Chicago Tribune, Chicago Magazine, WGN TV and Radio and a few other brands. PressThink: That’s partly a discovery of the residual power of a “print” brand, yes? Schmidt: Oh, totally. I explained to these women that it wasn’t the Tribune, that it was a product delivered with the Tribune. But that didn’t matter. And I learned from our sales team at TribLocal that the small mom and pop stores wanted to advertise in the Chicago Tribune but couldn’t afford its rates. They wanted something also that was just for their suburb or the next suburb over. But they didn’t want to advertise online because they were either afraid of it or didn’t see the value, so the printed paper was brilliant because it provided ads to small local businesses. PressThink: So this started you thinking about….? Schmidt: So then I started thinking: could we create a social network for Tribune Media Group that would do three things. One, allow our readers and viewers to upload all kinds of user generated content (stories, photos, videos, events) that would be geotagged auotmatically. Two, could Tribune Media Group then use that content wherever it saw fit (in Tribune, in RedEye, in Hoy, on TV, on the radio) and Three, could we sell targeted ads based on what we know about the people posting and what they’re interested in. So that ultimately what we would have is a reinvention of how the company finds news, distributes content and ultimately monetizes it while engaging its audience. Also, a fourth point–it would bring about the customization of news, so that we could start creating custom products based on the data we have about individual readers. PressThink: I want to present you with a quote from my friend Dan Gillmor: “I hope they’re going to find a way to reward the people who are doing the work. As I’ve said again and again, I’m not a fan of business models that say ‘You do all the work and we’ll take all the money, thank you very much. '” Did that worry you at all? Schmidt: You can only get people submitting great content for so long. Usually they’re submitting it out of ego or to support a business or organization. Schmidt: They lose interest or they’re so great, they get jobs where they’re paid for their work. What’s more, contributors need to have a stake in it too. And what’s what we ultimately did at ChicagoNow. PressThink: So how did Chicago Now propose to solve this problem? Schmidt: It was so surreal. We both had sketches of how our ideas would work and they practically matched. So within a month of our meeting, I moved downtown to Tribune Tower to work on ChicagoNow with Bill and the team he was putting together. Bill and Clark Bender, then the executive producer of ChicagoTribune.com, and I worked out the business model and the editorial policy of ChicagoNow. In a nutshell, we decided to start with recruiting bloggers to build an online community and ultimately, the site would grow into a social network over a year or two. Schmidt: I think a social network is where users have a lot of functionality–they can have full profile pages, they can friend each other or follow each other, etc. An online community is more a classic blog structure, where one person is leading the conversation by posts and everyone else can login to post comments to the original post. PressThink: Okay, so you began with that aspiration at Chicago Now, and what did you learn? Schmidt: So much. My job was to find and recruit bloggers to join the network. In the first three months, I personally interviewed over 100 bloggers. Bill and I did this together, actually, and what we learned was that the bloggers wanted full ownership of their content, they wanted to be paid, they didn’t want to be censored and they wanted to be published in the Chicago Tribune. Schmidt: Very. So Bill and Clark put together a great contract with our lawyers that essentially gave the bloggers these things. The bloggers would be paid based on pageviews, but only local pageviews. That was key because from a business perspective, ChicagoNow was being created by Tribune to reach local audiences. PressThink: Because there is traffic and there is traffic that has value. Schmidt: Yes. And we had enough national traffic to provide our advertisers, but we needed content that was both local and by vertical. So we incentivized the bloggers to build local audience however they saw fit. Schmidt: It did. As in, the bloggers did a good job of creating local content and building a following here in Chicago. PressThink: What I have seen (I am involved in a hyper-local product, The Local East Village) is that the advertisers in that model need a lot of hand holding. And they may not be users of online news and information themselves. This presents special difficulties. Does your experience match that? Schmidt: Yes, absolutely. And that’s what ultimately led me to my next position with 435 Digital. PressThink: So explain how that happened. Schmidt: At ChicagoNow, we saw that advertisers were very interested in a product that was so cutting edge. But they didn’t understand how it would help them get more customers. In several cases, advertisers didn’t even have websites to point customers to. How could they advertise on ChicagoNow? So Bill and another colleague, Bob McDonald, ended up creating a new business, 435 Digital, which is an in-house agency that provides websites, SEO and social media consulting for businesses. PressThink: You realized you needed to teach the people formerly known as the advertisers. Correct? Schmidt: Yes. So Bill asked me to move over to 435 Digital in October 2010 to work on its marketing campaign. He wanted me to write a blog about best practices for small business in the areas of SEO and social media. The blog was rolling along great. Meanwhile, I had been teaching several graduate classes at DePaul University on the intersection of social media and journalism. And on occasion, I would do a workshop for business people about understanding and using social media. So Bill asked me to test the concept of holding a class at Tribune Tower for our clients. Well, the classes started selling out. PressThink: At how much a pop? Schmidt: I started with very basic classes–like Intro to Facebook and Intro to Twitter. At the beginning, it was $50 for a 2 hour class held in a conference room at Tribune Tower. I literally brought the coffee in from Starbucks across the street and plugged my computer into a projector and put up Facebook and we walked through the site. Attendees asked for more classes on advanced topics– specifically using it for their businesses. We had no idea if it would work, or what it was, but by May, two months after I started, I was teaching two or three classes a week. PressThink: So you just began somewhere and iterated, correct? Which is the definition of a start-up. Schmidt: It wasn’t quite a start-up, though. Again, I had the credibility of Tribune, and could run ads in our paper to promote the classes. I use that example to explain that print is not dead; 95 percent of people came to class because they saw an ad in the newspaper. So by May, I had developed four different classes: Intro to Facebook and Twitter, Facebook for Business, Social Media for Business, and Create Your Own Blog. PresThink: And they were all making money? Schmidt: Yes, each class was making about $800-$1500. Bill then sent me to other Tribune markets to teach those classes for their readers and clients. What’s more, each class acted as lead generation for 435 Digital. PressThink: Other markets like…. where? Schmidt: Baltimore for the Baltimore Sun and Ft. Lauderdale for the Orlando Sentinel. PressThink: How did the classes turn into lead generation? Schmidt: Well, business owners came to the classes because they knew that they had to understand what social media was. After taking a class, they would come up to me and say they needed more help: could they hire someone to set up their accounts or actually do the work of running a profile for them? So then I connected them to our sales team and the team took it from there. PressThink: That’s a great discovery. Then you knew you had something, yes? Schmidt: Yes. I also started getting asked to do private seminars for businesses that I would customize to their needs and deliver. So I did that throughout the summer of 2011, including for the National Association of Realtors and the National Association of Broadcasters. PressThink: One part I want to zero in on is not only that these classes were a hit, and generated revenue and developed into lead generation, and also a second business providing private seminars, all of which is interesting and relevant, but also… how is it that you, Tracy, former reporter, knew enough about social media or Facebook to teach these classes? Where did that come from? Schmidt: Well, I grew up with Facebook. It came to campus when I was in my third year of college. And as a reporter at Time in 2006, I used Facebook to find story ideas and promote my stories once they were published. I ended up even writing a few stories about social media and Facebook’s rise for Time, and I also used Facebook as a tool to find sources during breaking news stories, most notably the shootings at Virignia Tech in April 2007. I had also designed graduate classes around using social media as a reporter. PressThink: It seems to me that if other news organizations are going to follow this model, and find a new source of revenue (one of many that they will need) then the key to it is to find an operating style, a way of doing business, a way of doing news and information, that teaches people in the organization skills that can then be sold to the people formerly known as the advertisers. Schmidt: So now my job as Educational Programs Manager at Tribune Media Group is identifying and executing classes on a range of subjects using our employees as the experts. Ultimately, we’d like to deliver the majority of these classes online. PressThink: Right, so the question there is: does the Tribune Company, by operating as a 21st century media company, build up domain knowledge that is valuable to the people formerly known as the advertisers, as well as the public? And your guesstimate is…. that it does? Schmidt: Yes. But then again, any company that has a strong brand and credibility has the capacity to offer these classes to the public. What is unique about the Tribune is we can reach massive audiences easily. What I can tell you, too, is that this model also can act as a lead generation for our entire company, in that someone might walk in the door and learn something, i.e. social media, and realize they first need a website to execute their social media strategy. And the Tribune can build that website for them. So you could apply that to all kinds of things and it has a big potential to scale. Also, another revenue model is attaching corporate sponsors to these classes. And that’s an avenue we’re exploring with lots of interest from advertisers. PressThink: How does that work? Schmidt: Well, an advertiser wants to reach 100 small local business owners, they can sponsor the class and have their brand attached to signage and handouts. And maybe get 5 minutes during break to tell the audience about their company. PressThink: An advertiser like… who? Schmidt: In Ft. Lauderdale, we did a six-seminar series over the course of three days for readers and advertisers of the Orlando Sentinel. Our colleagues at that paper secured a sponsorship from Comcast Business Class for all six seminars. PressThink: Have you been watching what other media companies have been doing in these areas? The New York Times has classes, and others like The Economist are trying to generate revenue from events. Schmidt: Yes, the New York Times is a leader in the space. And we’ve been offering classes like that for almost a year now with some of our columnists. Part of my new role is also scaling that program and offering it online as well. PressThink: Where the costs are lower? Schmidt: A bit lower but probably not by too much since we hope to allow participants to ask questions in real time. 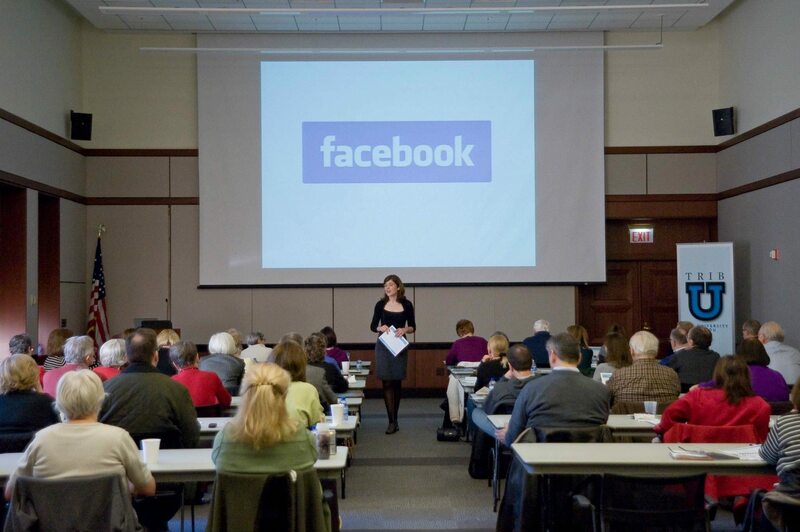 I should add, though, that I see big demand for social media classes in person. It’s hard enough to learn social media in person; through a computer it’s even harder. PressThink: “Presence” counts. That is one thing we have learned. Schmidt: Absolutely. I’m interested in how media companies can take advantage of the “experience economy” and create live experiences that educate or entertain their readers. In the last two years, the Chicago Tribune has created an entire live events program. One about policy issues, one about sports, and another a live radio show done in conjunction with Second City. PressThink: Taking all of this in, what does a news brand turn out to be? What have you learned about the “hidden” value of a news brand? Schmidt: A news brand is about credibility and trust. When readers, contributors or advertisers hear that the Chicago Tribune is attached to a new product, they know that it will have integrity. And they at least consider the product, even if ultimately they decide it’s not for them. PressThink: Well, that’s the way we have always thought about brands. Schmidt: I think that it’s important to still put out the product the brand is known for. In our case the Chicago Tribune is our anchor, and it gives us the freedom to explore other ways of distributing the news and monetizing it. PressThink: Looking back now over the whole story, from when you were a reporter for Time living “off” the business model without worrying about it, to the present, where you are directly involved in generating revenue, how has your view of journalism changed as you have moved from one responsibility to another? Schmidt: I still think like a reporter wherever I go. I ask hard questions and look at things from different angles. That helps a lot in thinking up new ways of doing things. But it also makes me think about integrity and ethics in business. As in, if we made a business decision and it was a bad one, how would that affect the integrity of the work our colleagues are doing in the newsroom? I still don’t disclose my political beliefs on Facebook, for example. I suppose I could now that I’m no longer a practicing journalist, but I don’t think I will. PressThink: That’s an argument for sending more journalists over to what used to be called “the business side.” Isn’t it? Schmidt: Absolutely. One idea I’ve toyed a lot with lately is how do we reinvent journalism schools. Schmidt: We could we create an apprenticeship program within media companies wherein college students learn the trade and they teach older employees about technology and social media. So it’s like a generational exchange. Journalism students absolutely need to learn about the business side of the media. I wish I had learned it in school myself. PressThink: Some of my own graduate students in Studio 20 gravitate to these management puzzles. They want to learn how to sustain journalism by being responsible for the business. Tracy, thanks for taking the time. CN = Miserable failure, by any measure. A quote from Mashable (!?!) before the implosion hardly counts as a metric. Teaching Facebook to seniors, and selling “social media services” to unsuspecting Ma & Pa store owners… Wow, what a wonderful trajectory for a journalist. You sell snake oil from the Titanic known as Tribune. Congrats! In the meantime, who is doing the hard investigative journalism that we need to expose the corruption and greed? That’s why journalists didn’t used to delve into the business side. I get that the world has changed, but we’ve lost so much. I think Schmidt is doing a great job of trying new things on the business side. There are definitely people in the community, and those who own businesses, who want to learn more about things like Facebook, Twitter, and online communities. I’m always shocked when I find a business that does not have a website. Kudos to her for reaching out to them and teaching! To the other commenters: As she’s no longer a reporter, I wouldn’t expect her to be doing investigative reporting. The actual reporters at the paper will continue doing that, and hopefully because of people like Schmidt trying new business ideas, the reporters will continue being paid to do this important work.